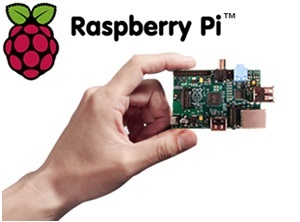 The Raspberry Pie (Raspi) is a credit card sized $30 computer. It has an ARM processor, digital screen output, USB interface for keyboard and mouse and other peripherals, an Ethernet port, and it runs Linux from an SD card. It also has an I/O port that can be directly connected to switches and LEDs, although if you get a connection wrong you can blow your Raspi. There are add on boards that can isolate the the connections and drive higher currents. So why am I mentioning this in a model railway blog? I have a couple of Raspi’s but have not done much with them yet. I am always thinking of ways of using them in model railways. I notice that there are several signal levers available now with in built switches and with my interest in signalling may come up with an interlocking program, but that may take some time. It has occurred to me that I could just use one to drive multiple LEDs on my diorama. At first it may seem OTT to use a computer more powerful than a BBC micro to drive a few LEDs, but with lights in multiple rooms a very realistic pattern of switching on and off could be achieved. Also, software could be used to create fire or arc welding effects. Connecting a light sensor to detect darkness would be easy. The Raspi is so cheap that it can be used in distributed applications where several talk to one another to achieve an objective. They can also be run off a battery, but the Ethernet port consumes a great deal of current, so if you don’t need networking and want to run off a battery, use the model A which lacks this port. I recently attended an evening talk at Pendon Museum about photographing models given by Andy York, RMWeb. I wasn’t expecting to learn so much about photography in general and my camera in particular. In these days of digital compacts it is too easy to point and click, check the result, and if it’s not good enough, try again. No need to take care with shutter and exposure, and then wait a week for the results. I did a commission once for a friend with two camera bodies only to find when the prints came back I had a light leak in one of the bodies and the results were ruined. When I decided I needed an auto focus SLR I went for Canon EOS. It is an indication of the hobby that my first body was 35mm, which I later replaced with an APS body, and again replaced that with a digital one. I only ever used any of them in automatic mode. During his talk Andy York emphasised using a tripod and setting up your camera manually. Reaching for my compact I was astonished to find so many manual adjustments. I need to read the manual. Pendon laid on some food, allowed a wonder around the museum before an entertaining, informative, and thought provoking talk for £10. If you live within striking distance of Pendon I thoroughly recommend future talks. On Sunday 5th May I went to Thornbury MRX north of Bristol. Although it is 100 miles from home it is one of the best shows in the calendar. The previous evening Liza Tarbuck on Radio 2 asked what listeners were doing this weekend and I emailed in. She read my email within five minutes but I have no idea if this free publicity swelled the numbers attending the show. 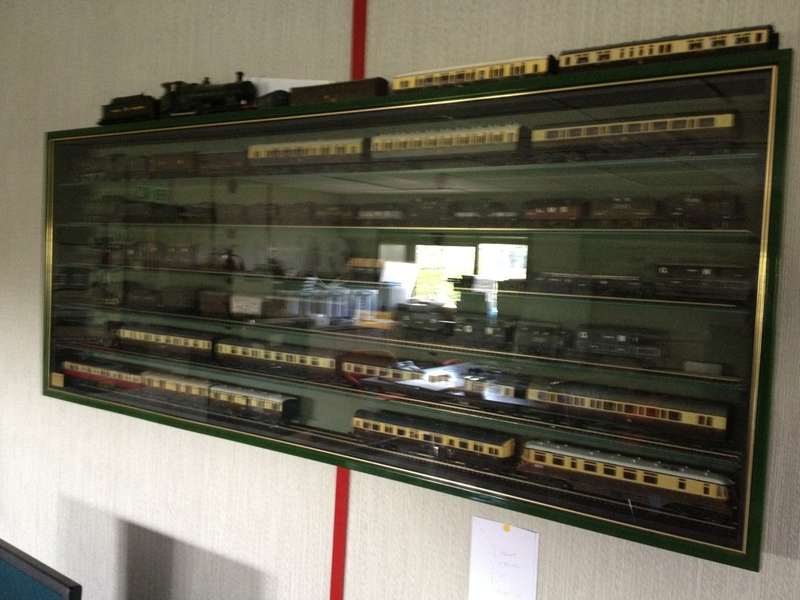 There was a large number of exhibits including an N gauge GWR branch in a glass top table. 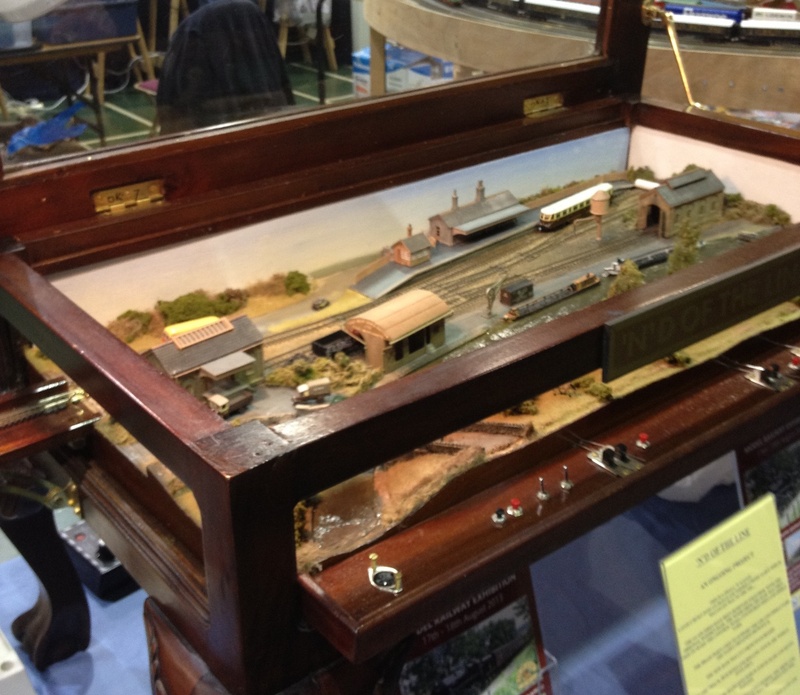 There was a stand demonstrating T Gauge-the T representing the 3mm track gauge. It seems to be powered by fairy dust, because a working motor that size is barely credible. As I get older my eyesight needs a migration up the scales, not down. I managed to have a chat with my friend Nigel Bird and purchase a few items for my diorama including the main factory, a length of C&L OO track, and a ballast laying device with some ballast in two shades. It was worth the round trip, and if you haven’t been before, make a date in your diary for next year. The maximum size is 35 cm x 30 cm (D) x 35 cm (H) – to fit on a shelf in the cabinet. I haven’t done any modelling for years, so this gives me an opportunity to do something constructive. As I have stated before I have a number of kit built wagons, so I will build a small industrial scene with a few of my wagons. I identified a suitable card kit for the buildings which is exactly the right length. My mother was an art teacher and has promised to paint a small backscene. The hard part will be to make it look busy, but not too busy. If I can get the base and building built in the next couple of months, it gives me a few months to search out and install all those bits that make it look real, such a lamps, huts, crates, sacks, and people. That will be fun. I want to use this blog to document my railway modelling. I hope it finds an audience somewhere.